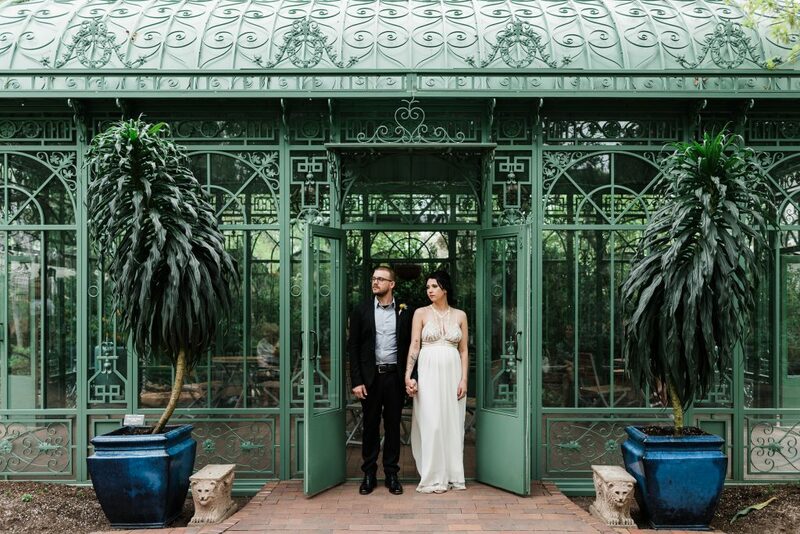 There are so many truly magical places to elope in Colorado. Some of our favorites are below! If you’re a fan of the outdoors, one of the best backdrops near Denver are the Flatirons, which overlook the great city of Boulder. Draped with wildflowers and low forest foliage, Chautauqua Park is a great spot you don’t have to hike into to get a stunning view. Just a brief 30-45 minutes out of Denver, you can’t go wrong with this beautiful outdoor location for your ceremony. Travel fees may apply. 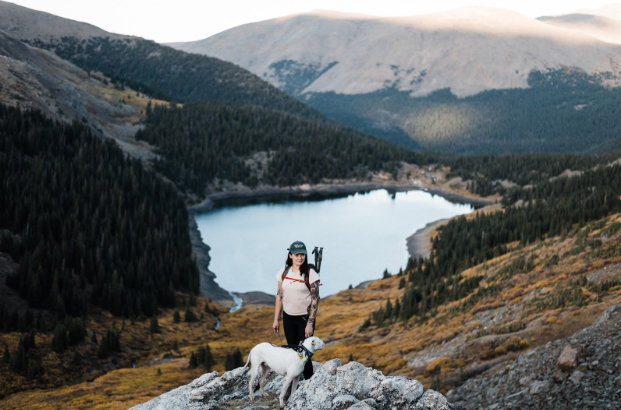 If you and your honey are seeking to immerse yourself in the great outdoors, few beat the natural beauties of Rocky Mountain National Park. With private lakesides to choose from and the Rockies at your back, your photos will be nothing short of epic. 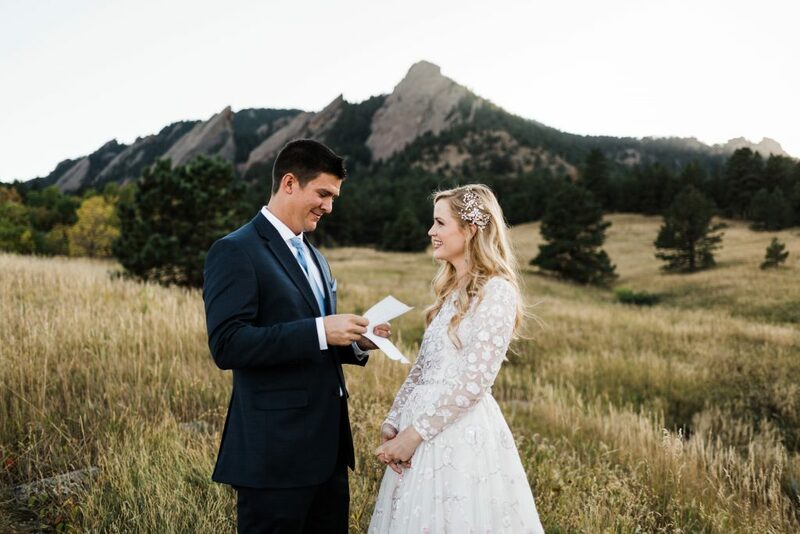 You have the option of either taking a day trip (The Rockies are about a 2-hour drive outside of Denver), or find a lakeside cabin to nuzzle up in after your ceremony. Travel fees may apply. Sapphire Point is a really special place with one of the best views of the state. 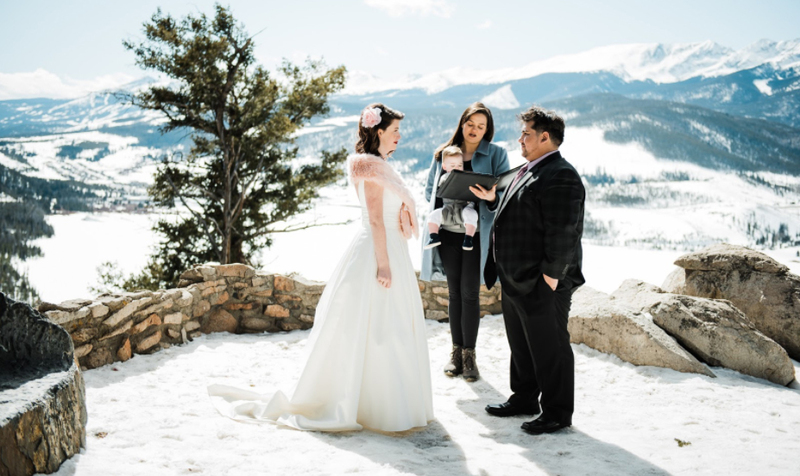 Situated a little less than an hour and a half west of Denver, this intimate venue is perfect if you’re into mountainous views for your elopement. We highly recommend this spot! Travel fees do apply. Are you ready for some of the most visually stunning rock formations in the United States? Located on the eastern plains of Colorado, this diverse area is sure to steal your heart. 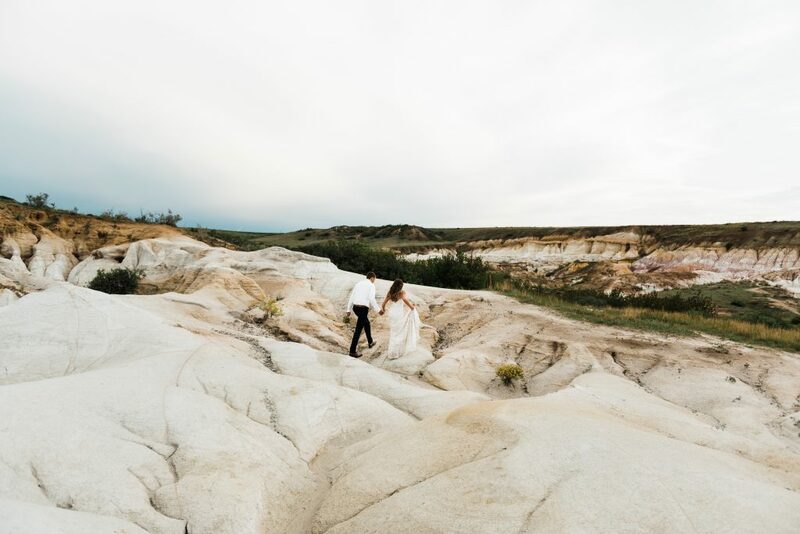 The park is scattered with hoodoos, sandstone-capped spires, grasslands and colored clay that will blow your mind—the perfect backdrop for your perfect elopement! Travel fees do apply for this spot. 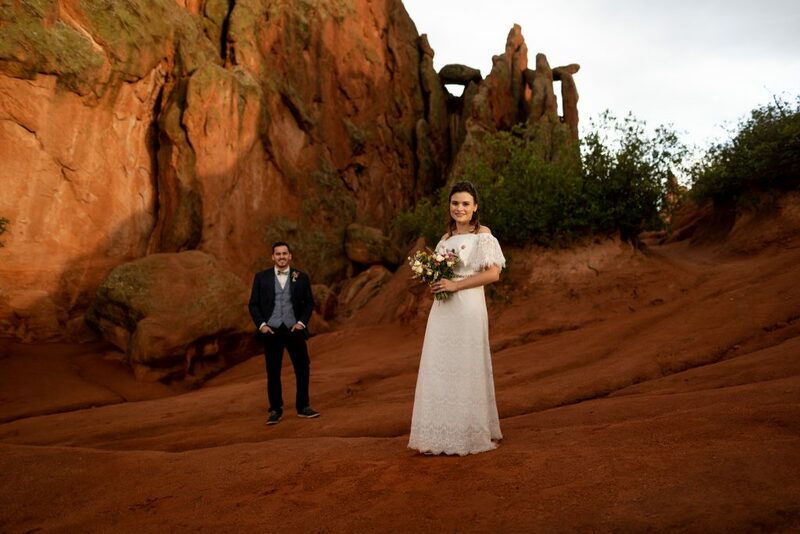 If you’re a fan of mountains and desert, Garden of the Gods is a supreme location for your elopement. The red peaks backed by blue skies make for unbelievable photographs. This is a great spot if you’re seeking a quiet nook for your epic elopement. Travel fees do apply. If you and your honey are lovers of nature, the Denver Botanic Gardens is one of the best gardens in the states. With species from all over the globe, their gardens range from Japanese Gardens, to high desert flower, from oak groves to aquatic beauties. This location does require a $130 photography permit (that doesn’t include fee for ceremony, which run $800 – $1800, pending the spot in the garden you choose; Water Garden Gazebo starts at the low end at Solarium runs at the high), but it’s well worth it! Say your vows among the flowers and bees. The following locations are beautiful, remote mountain lakes that require a hike to reach. Therefore they are exclusive to couples that choose our Wildflower Package. Learn more about the Wildflower Package experience here. Silver Dollar Lake is a stunning alpine lake in Colorado’s Arapaho National Forest. The lake is surrounded by trees and wildflowers and offers sweeping views of the surrounding mountains. The trail to Silver Dollar Lake is 3-miles round trip and is gorgeous every step of the way. Once you reach the lake, you’ll see a spillway which makes a small waterfall surrounded by wildflowers. Dogs are allowed on the trail, so you can bring your fur-baby along as your witness (it’s legal in Colorado!). It’s named Dream Lake for a reason. This Rocky Mountain high alpine lake looks like its straight out of a dreamy fairy tale. The trail to the lake is a 2.2-mile out and back hike, which passes by the beautiful lily pad-laden Nymph Lake. Dream Lake is an incredible spot for a ceremony and photos, especially with Hallet Peak towering in the background. 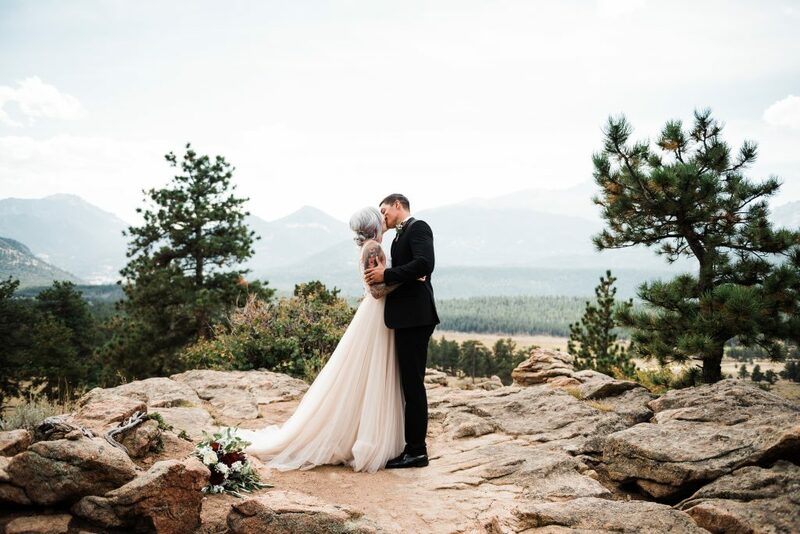 Though, Rocky Mountain National Park does not allow actual ceremonies at this dreamy spot, it’s the perfect place for your photo session after your ceremony at another designated RMNP location. Ask us for details! 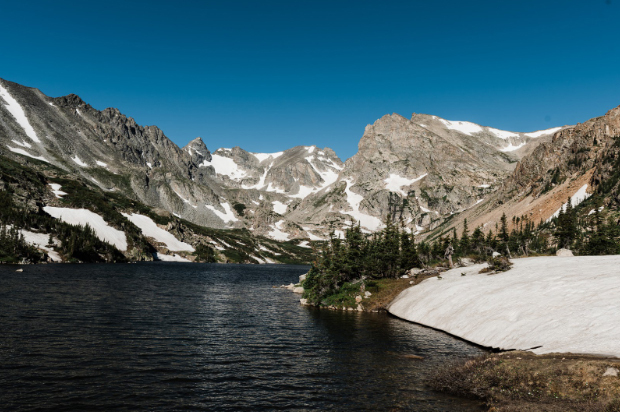 Located in the heart of the Indian Lake Wilderness, Isabelle Lake is a true Colorado alpine lake. The 6.3-mile round trip hike is brimming with beauty and nature, including a waterfall, wildflowers, streams and rock features. The lake can be reached year-round and offers spectacular scenery in all four seasons. 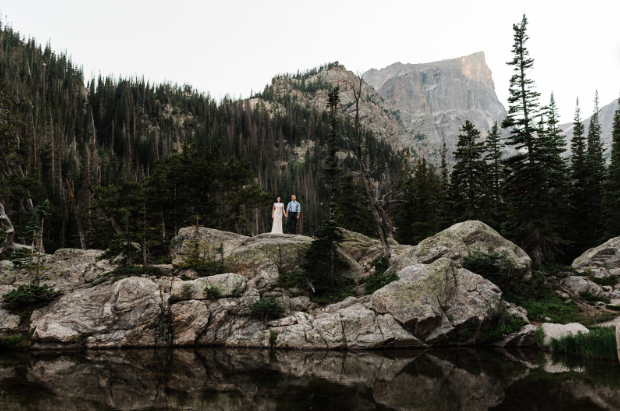 An elopement at Lake Isabelle is perfect for couples that want to capture their love for each other and the outdoors on their wedding day. 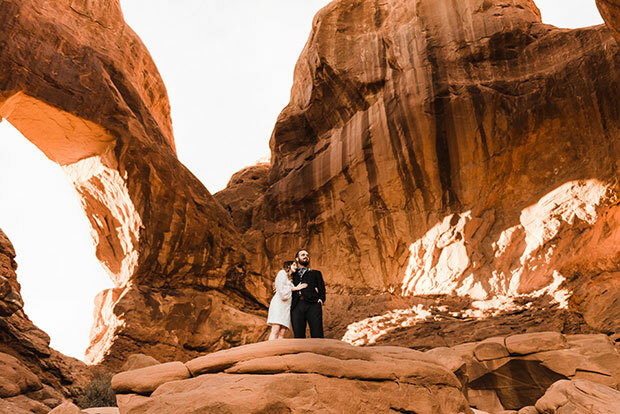 One of the most incredible landscapes in the world and just beyond the Colorado border, eloping in Moab is a one-of-a-kind experience. With its massive red rock formations, towering mesas overlooking deep canyons, and multiple gorgeous National Parks, Moab has no shortage of places to elope.